At the corner of the garden is a sizeable ornamental cherry blossom and it has beautiful double-flowers of the most delicate soft pink. It comes out rather late in terms of blossoming cherries. When most have already flowered and finished, ours is still thinking about it. It is worth the wait though, as the blossom begins to open from mid April and the whole lifeless tree suddenly erupts into a mass of pink made up of countless small hanging flowers. This photo doesn’t quite reflect that and that’s because it was only taken recently. 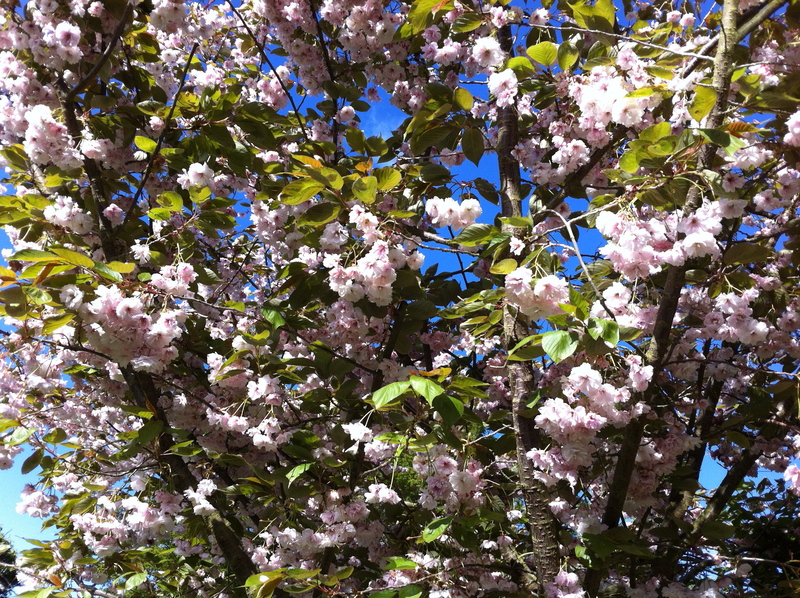 It has taken me about three weeks to catch the blossom in the sunshine and take a picture. It’s been dull and usually raining at any other time. By now – especially with the recent windy weather – there’s only half the blossom left on the tree, the other half is all over the garden. 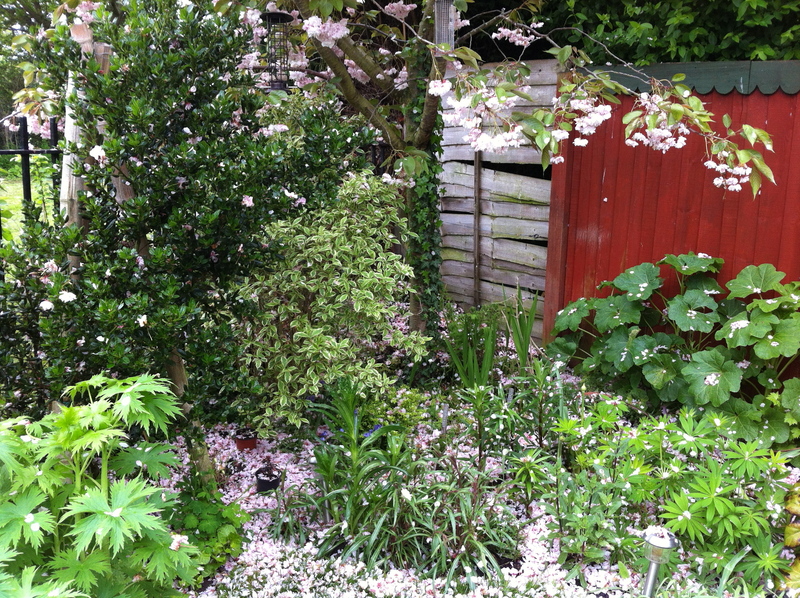 The shedding of the cherry blossom about the garden marks another point in the year for me. It’s the passing from the excitement of spring into the more stately and inevitable march of early summer, where the garden grows higher, fills out further and continues to flower. The small and delicate early flowers of spring will be replaced with the large and bold blooms of summer. It’s a different feeling of excitement and anticipation. I can’t adequately put into words what it feels like to sit beneath the tree at this time of year. The ground is pink with a cover of soft petals and the arching boughs overhead are heavy with hanging blossom. The wind blows through the tree canopy, making the branches sway lazily and loose petals are caught on the gusts and swirl around me before landing somewhere in the garden, filling out the carpet of pink. It is quite moving and there’s only a one week window where it will feel like this, then the magic is gone for another year.